Welcome to Florida and welcome to the lightning capital of the United States. 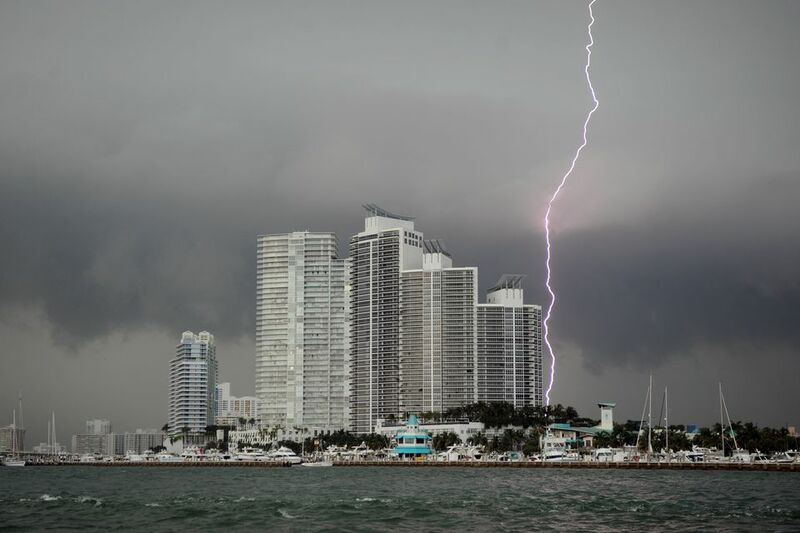 Lightning strikes in Central Florida during the summer months more often than anywhere else and is the most deadly. But don't cancel your plans just yet — over a ten year span there have only been 52 fatalities in the entire state. Of course, one fatality is too much, but the point is, that the odds of getting hit by lightening are very slim. However, it is always important to be prepared, should you find yourself stuck in a lighting storm. So, let's take a closer look at this force of nature and your knowledge of it by taking this simple true or false quiz. The rubber tires on a car can protect you. False. It's the metal framework of the car that dissipates the force of the lightning. The tires have nothing to do with it. As long as you don't touch any part connected to the vehicle's frame, a hard top car, bus, truck or van is safer than being outside. The average lightning bolt is only one inch in diameter. True. That one inch bolt can carry as much as 100 million-plus volts and pack heat to 50,000-degrees Fahrenheit -- that is three times hotter than the surface of the sun. Lightning never strikes the same spot twice. False. Although not in Florida, the Empire State Building in New York City is hit an average of 25 times per year. If you get struck by lightning, you will die. False. Lightning kills about 100 people and injures another 500 in the United States each year. Actually, only 10 percent of people struck by lightning die, however, most survivors do suffer lifelong severe medical problems such as memory loss, headaches, dizziness, fatigue, sleep dysfunction, attention deficit and irritability. A storm must be directly overhead to be dangerous. False. Lightning is unpredictable. It can strike up to 25 miles away from its parent storm. It can literally strike out of the blue. Even if you got all the above questions right, do you know what to do to keep yourself safe in a thunderstorm? Do you know where NOT to be when lightning looms? In Central Florida one thunderstorm can generate a thousand or more lightning strikes an hour. Don't be blase. Learn how to protect yourself. Follow the tips below. . . and stay safe! Follow the 30/30 rule. If the time between seeing the flash of lightning and hearing the thunder is less than 30 seconds, take shelter. You are in a strike zone. Immediately get away from pools, lakes and other bodies of water. Never use a tree as a shelter. Avoid standing near tall objects. Keep away from metal objects including bikes, golf carts, umbrellas, fencing, machinery, etc. Get indoors if at all possible or get in a hard-topped vehicle. Remain in shelter for 30 minutes after the last flash of lightning. Stand clear of windows, doors and electrical appliances. Unplug appliances well before a storm nears - never during. Avoid contact with pipes including sinks, baths and faucets. Do not use the telephone except for emergencies - and then use cellular or cordless phones.